Senior JVP leaders addressed a gathering at the public library in Kandy to mark the occasion. Critics of the Marxist – Sinhala nationalist party say that the JVP’s persistence in observing the memory of the 1971 insurrection shows it is still tacitly harbouring the old desire to capture state power through violent and other non democratic means. 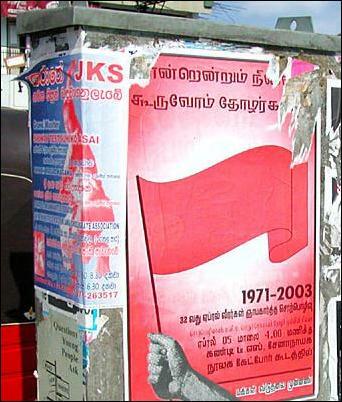 Thousands of posters commemorating the JVP cadres who were killed by Sri Lanka army and Police during the 1971 insurrection were pasted in the capital and all towns and villages in the Sinhala majority districts of the island. The JVP’s leader, Rohana Wijeweera, and most of the party’s central committee survived the bloody government repression in 1971. Many second level leaders left the party during years of incarceration. Some of those who remained with Mr. Wijeweera fell out with him in the mid eighties over the JVP’s stand on the Tamil national question. The JVP had to face brutal government repression again when it made a second attempt to seize power in 88-90. Mr. Wijeeweera and his lieutenants were captured and killed by the SLA. The party is now led by the only survivor of the JVP’s 1971 central committee, Mr. Somawansa Amarasingha, who lives in exile in London.